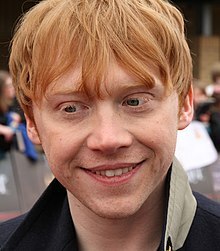 روپرت قرینت (اینگیلیسجه: Rupert Grint) بریتانیالی فیلم یاپیمجی‌سی و اوْیونچو. ۲۴ آقوست ۱۹۸۸ ‏ ایلینده دۆنیایا گؤز آچیب. 2000–گۆنوموز ایللر آراسیندا سینما ساحه‌سینده چالیشیب. 2012 American Dad! Liam (voice) "Killer Vacation"
↑ John Malkovich to Play Hercule Poirot in Agatha Christie’s ‘The ABC Murders’. https://variety.com. یوْخلانیلیب23 May 2018. ↑ 2002 6th Annual SATELLITE™ Awards. Satellite Awards. آرشیولنیب اصلی نۆسخه‌دن on 10 May 2011. یوْخلانیلیب5 June 2011. ↑ ۳٫۰ ۳٫۱ "Twenty-Third Annual Young Artist Awards 2002". Young Artist Awards. ↑ Carroll, Larry (24 April 2006). "Alba, Carell, 'Crashers,' 'Virgin' Big Nominees For MTV Movie Awards". MTV. Retrieved 5 June 2011. ↑ "National Movie Awards 2007 winners". BBC News (BBC). 29 September 2009. Retrieved 5 June 2011. ↑ Lee, Angela. 2009 Portrait Choice Awards as voted by YOU!. Portrait Choice Award. یوْخلانیلیب5 June 2011. ↑ Press Office – Radio 1's Teen Awards winners announced. BBC (15 November 2010). یوْخلانیلیب8 November 2011. ↑ BRAVO OTTO-Wahl 2010! (German). Bravo. یوْخلانیلیب5 June 2011. ↑ Johnny Depp, Sandra Bullock Top 2010 People's Choice Awards Winners. AOL TV. AOL Inc (7 January 2010). یوْخلانیلیب5 June 2011. ↑ "Nominees and Trailers". National Movie Awards. ↑ MTV Movie Award Staff (3 May 2011). 'Eclipse,' 'Inception' Lead 2011 MTV Movie Awards Nominations. MTV. یوْخلانیلیب30 May 2011. ↑ 2011 IGN Award for Best Ensemble Cast. IGN. یوْخلانیلیب13 November 2011. اینگیلیسجه ویکی‌پدیاسی‌نین ایشلدنلری طرفیندن یارانمیش«Rupert Grint»، مقاله‌سیندن گؤتورولوبدور. ( ۲۲ ژانویه ۲۰۱۸ تاریخینده یوْخلانیلیبدیر). قارداش پروژه‌لرده روپرت قرینت گؤره داها آرتیق بیلگی‌لر تاپابیلرسینیز. بۇ صفحه‌‌ سوْن دفعه ‏۱۳ مارس ۲۰۱۹، ‏۱۲:۳۱ تاریخینده دَییشدیریلمیشدیر.